I love it when I get surprised by someone doing social media right! 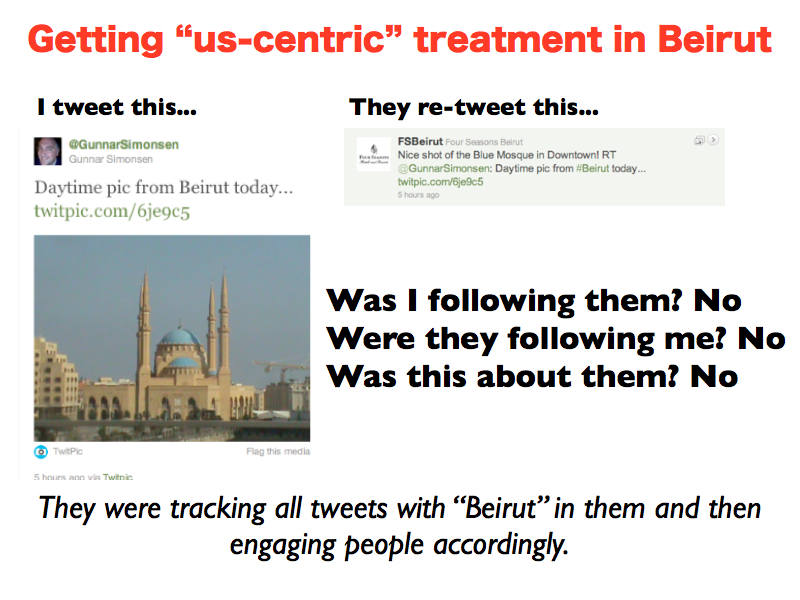 This is what happened to me while recently visiting Beirut, Lebanon to conduct a social media workshop. Matter of fact, I was so pleasantly surprised, I added this act of social media brilliance immediately into the workshop I was conducting there the next day. 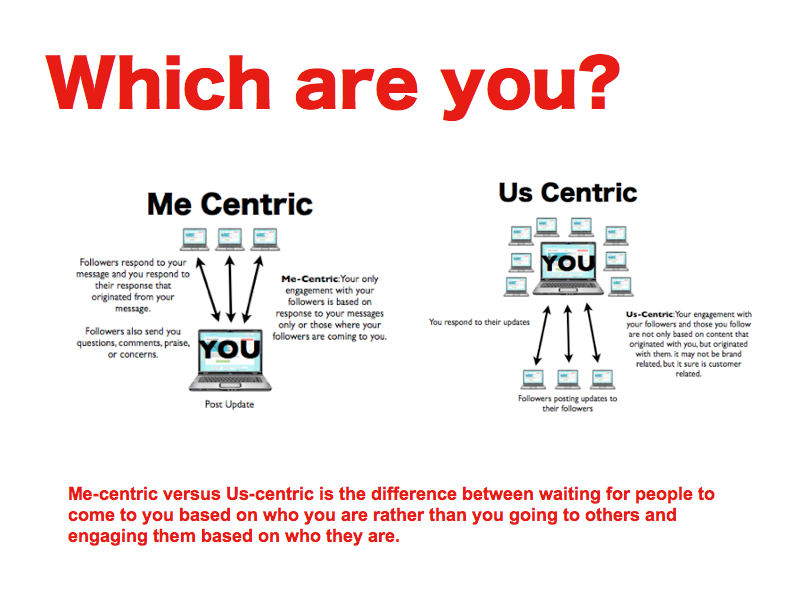 It was a perfect example of what I discuss about having an “us-centric” strategy versus just having a “me-centric” strategy with your social media use. Below, is the slide where I discuss these different strategies. With this, of course I now find myself following them and engaged in all of their activity. And, as I have been traveling the world discussing social media, I needed to find out more about who they are and what they do with regards to using social media. Below is my interview with the Director of Public Relations for the Four Seasons Hotel Beirut, Suzan BouDargham about social media. Q. How long has Four Seasons Beirut been using social media to connect with guests and potential guests? A. Twitter and Facebook are the main platforms. We have presence on youtube.com which we are planning to develop further in 2012 as its fast becoming the world’s second most important search engine. We work on leveraging the Hotel’s presence on online social groups the likes of ASmallWorld.com and LinkedIn and are actively participating in location-based apps such as Foursquare and Gowalla. Q. How are you using Twitter different from Facebook? A. With content restriction (140 characters) on twitter and speed of info being shared, our message has to be short, meaningful and straight to the point. Our tweets cover direct sales of hotel offers, engaging with potential and existing hotel customers, engaging in daily twitter topics with content relevant to the country or to what the hotel has to offer, presenting our employees as expertise in their own fields, make sure we are involved in daily forums the likes of #FriFotos, #TravelTuesday, #TTOT, #WeddingWednesday or #WineWednesday. On Facebook we have more space to work with by using content and images. 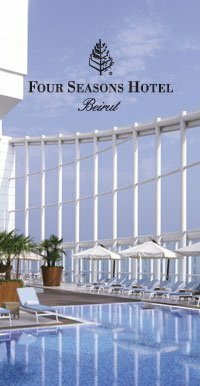 On Facebook we focus on highlighting different aspect of the hotel including the employees, F&B outlets, Chefs, create themed days or topics such as a guide to Lebanon showing what is not usually communicated by travel agencies or on television. Q. How much time per day do you spend managing your social media profiles? How many people manage it? A. Social media is handled by the hotel’s Director of Public Relations supported by hotel’s departments to maintain regular flow of content. Collectively a minimum of 4 to 5 hours is spent on social media throughout the day (till 12 midnight) which involves: checking trend of the day or the week, responding to various guest requests, engaging in daily online discussions, looking for potential clients, engaging with influencers to keep them interested in the property, promoting the country, the hotel, its people and finally checking the political discussion on-line which is important in our case and for Lebanon to see what are people talking about, using which tone so we could cleverly select a topic that would divert international guests’ attention from. Q. What are your goals for using social media? A. Maintain our position as leaders in the Lebanese hotel sector on social media with a content that caters to affluent travelers from different age group and of different taste and interest on the international and local level. Interests could vary from fashion to beauty, lifestyle, health and spa, weddings, travel, adventure etc…. Respond to guests in a timely manner is also essential which shows that the hotel is attentiveness to what they have said and have acted upon it accordingly. A core goal we have at Four Seasons Beirut is to promote what Lebanon has to offer to different guests with different tastes the Four Seasons way. Q. How do you measure success with those goals? A. There are two ways in measuring success either locally by checking the increase or decrease in number of followers which acts as an indication of the interest in your content, engagement ratio vs each tweet or post to retweeting or sharing your post. In addition to this Four Seasons have a dedicated company measuring all on line activities and reporting results to each property on which then the right action is taken by either changing the strategy or keep doing or enhancing what is currently done. Q. Has using social media been effective for Four Seasons? A. FSHR have made digital their priority; it now represents half of our consumer marketing investment. And since content is king, PR was combined with social media. Q. Have you ever had to deal with the negative comment about your hotel that was posted online? How did you deal with it? A. Four Seasons found that guests use social media, notably Twitter, to comment on their satisfaction during a stay. Because of this, we have incorporated them into our service delivery so we are able to address issues, anticipate needs and generally surprise and delight the guest, using information they have shared publicly as well. Q. What’s your favorite part about connecting with people using social media for Four Seasons? A. The positive post or tweet a current or a potential Four Seasons guest share with the social media world at the end of his visit, experience or stay if it was about the service, a tip we provided or a surprise we prepared for. Q. I notice that not all of your posts are “Me-Centric” (only about Four Seasons) Often times I see retweets and posts about your followers, Beirut, and Lebanon in general. Is this by design to make it about more than the hotel? If so, why? A. Very true, this was part of the strategy we have created for Four Seasons Beirut social media, so we could be interesting and appealing to a wider clientele. As mentioned earlier presenting Four Seasons is not just about the hotel, it’s about the people working in it, the level of knowledge we have in the market, how much we know about Lebanon and how could we add value for the online customer experience. Our guests are knowledgeable and they have various interests hence talking the same language with them is so important to make them feel this is the right place to be in and the right people to engage with. Please follow @FSBeirut on Twitter and catch a glimpse of Beirut, Lebanon as I have experienced through them. On my next stop there, I look forward to seeing my new friends at the Four Seasons. With this, I want to say… GREAT JOB on using social media and for making me a fan to my new friends at the Four Seasons Hotel Beirut!